Adding to its Tax Increment Financing districts in areas of vibrant economic development could provide millions for public projects and shield the city from more cutbacks in state aid. Portland officials plan to add more than a dozen properties to the city’s network of tax shelter districts, a move that could shield hundreds of millions of new tax value from state assessments and protect the city from reductions in state aid. The city also wants to expand the possible uses for tax revenues resulting from new development in the districts to include a broader range of infrastructure and job-creation projects. The Portland City Council’s Economic Development Committee voted Tuesday to recommend a package of changes to Portland’s three biggest Tax Increment Financing districts covering the waterfront, downtown and Bayside. The districts are special areas not counted as part of the state’s assessment of city property value. Tax revenues from new development in these TIF districts can be diverted back to commercial developers and businesses, or placed in special municipal development accounts to pay for local projects outside of the city’s regular budget. The measures need to be passed by the full City Council and approved by the Maine Department of Economic Development. If they are used to their maximum extent next year, the city could shelter four times as much tax value as is now included in those three districts and almost quadruple the tax revenue that the city has on hand for specific projects. By the time the last district expires, in 2044, the city could shelter as much as $7.7 billion in new tax value and collect $207 million in captured revenue, according to city projections. That figure depends on the level of new development in the three areas. The waterfront district was created in 2002, the Bayside district in 2003 and the downtown district in 2015. Each district expires after 30 years. “We are clearly updating the TIF districts to align them with future investment needs in the city,” said Economic Development Director Greg Mitchell. The proposal heading to the council does not include any tax breaks for developers and instead directs tax revenues to a long list of potential public projects. City planners propose spending money from expanded TIF districts to pay for street work, waterfront parking, a new public pier and utilities infrastructure, as well as staff salaries and program costs. Funding for a city-sponsored workforce training program also is under discussion. “These are investments the city needs to make anyway. Why not be creative and use the TIF program” and get the added bonus of a tax shelter from the state, Mitchell said. 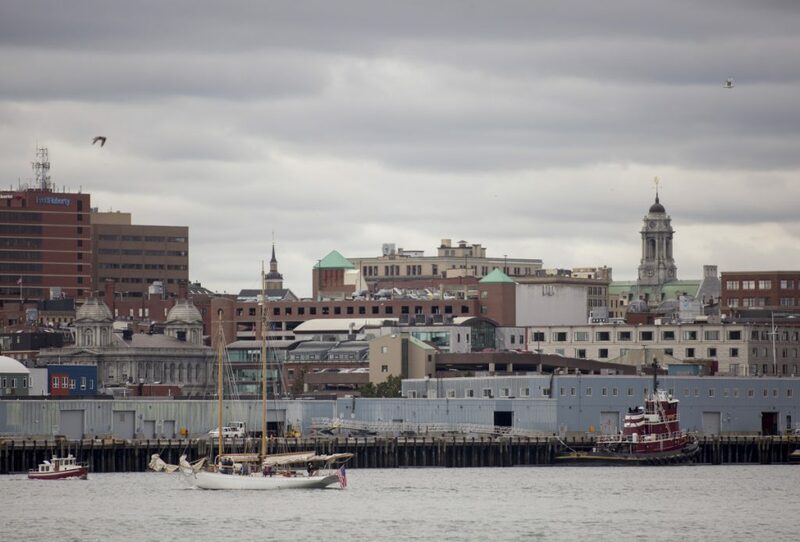 One of the biggest changes in the package would expand the city’s 16-year-old waterfront growth area to include virtually all of the land and piers along Portland Harbor. The number of tax-sheltered properties along the waterfront would expand threefold, from five unconnected properties on less than 7 acres to 16 properties covering more than 76 acres. 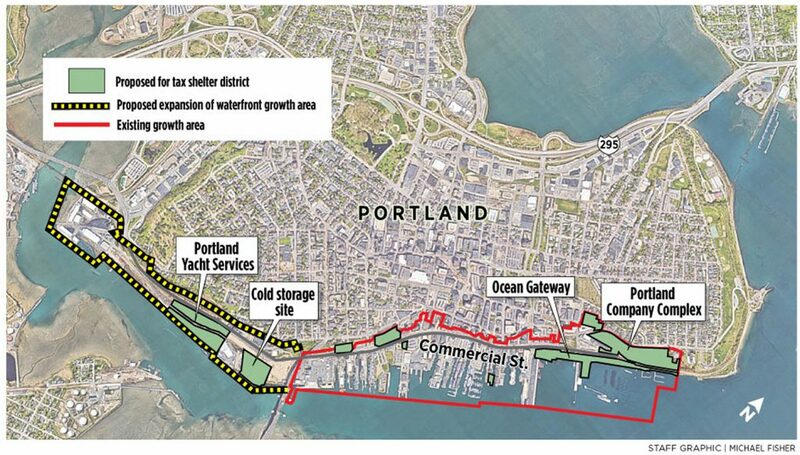 The expanded growth area would encompass developments such as the massive Portland Co. and Shipyard Brewing Co. brewery redevelopments on the eastern waterfront, a planned hotel and condominium complex on the former Deering Lumber site in the central waterfront, and a new ship maintenance building and proposed cold-storage warehouse along the western waterfront. In total, the potential property value covered by the waterfront district could balloon from $39 million this year to almost $169 million in 2019. The annual property taxes Portland could direct to projects in the district could soar from about $629,500 to more than $3.8 million next year, according to city projections. If Portland keeps all the revenue generated by the waterfront TIF in a development account, it could wind up with close to $100 million by the time the district expires in 2031. The city has plans for that funding. An amended planning document required for state approval proposes a new public pier at the Ocean Gateway ship terminal, and adding utilities and waterfront parking to an existing list of potential projects that includes harbor dredging and work to ease congestion on Commercial Street. Sheltered revenue may provide the matching funds that Portland would need to secure federal or state funding for an expensive construction project such as a new pier, Mitchell said. “It’s just an option, depending on the amount of revenue generated in the TIF program,” he said. State approval of such tax districts is routine as long as proposals stay within the state’s legal limits on the overall area included and other standards, including limits on what development funds can be used for. Portland should get state approval for its development plan as long as it doesn’t break any program rules, said Doug Ray, spokesman for the Department of Economic and Community Development. “Our role is to make sure the TIFs follow statutory compliance. We don’t say if it is a good TIF or a bad TIF,” he said. As part of its overhaul, Portland plans to increase the amount of new tax valuation it can capture from 22 percent to 100 percent in the sprawling transit-oriented downtown district that stretches across most of the Portland peninsula’s business zone. Maximizing the amount of value that the city counts in that tax district shields more of it from state assessments that calculate how much Portland receives in public school funding and municipal aid. In other words, if Portland has less value on paper because new high-value properties are sheltered, it may get more funding from the state, while at the same time generating revenue to pay for city-level improvements, said District 4 Councilor Justin Costa, chairman of the Economic Development Committee. By doing so, the city may avoid the kind of budget disruption it went through last year, when it had to trim school budgets after losing state aid, Costa said. Portland could avoid losing $4.1 million from the state and Cumberland County taxes next budget year if it shields all of the value outlined in amendments to the three tax districts, according to city projections. Just because the city is allowed to shelter all of the new tax value in a district, it doesn’t have to. Between 2003 and 2018, the city captured the allowed 100 percent of valuation of the Bayside tax district only once. The proportion captured in that district has ranged from 1 percent in a couple of years to as high as 97 percent in others. How much city authorities put into sheltered development accounts depends on budget priorities and whether the revenue is needed for regular expenses, Mitchell said. Workforce development is one area that city officials and businesses have agreed needs more attention, but that the city can’t afford, Costa said. The amended plans would allow Portland to use revenue from all three districts to fund employment training programs. Training is allowed under the state’s tax increment financing statute, but it is still unclear what form it can take, Costa said. He has considered an apprenticeship program or English-language skills training for immigrants and refugees in Portland.